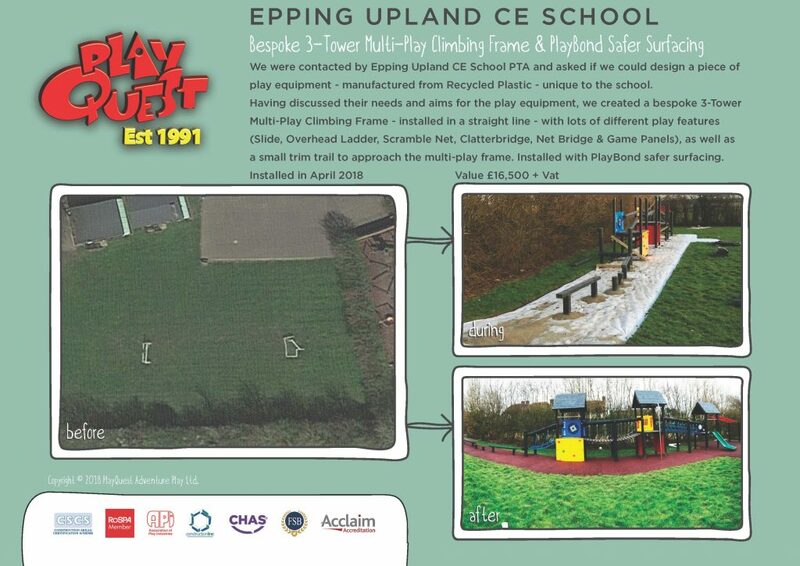 We were contacted by Epping Upland CE School PTA and asked if we could design a piece of play equipment – manufactured from Recycled Plastic – unique to the school. Having discussed their needs and aims for the play equipment, we created a bespoke 3-Tower Multi-Play Climbing Frame – installed in a straight line – with lots of different play features (Slide, Overhead Ladder, Scramble Net, Clatterbridge, Net Bridge & Game Panels), as well as a small trim trail to approach the multi-play frame. Installed with PlayBond safer surfacing.